Set for completion by 2021, Ballpark Commons will be much more than a ball park. 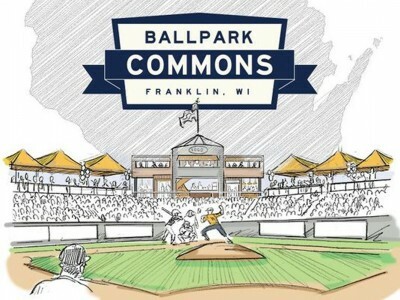 The $125 million, 300-acre mixed-use development in Franklin, WI will include a 4,000-seat stadium which will be home to The Milwaukee Milkmen, a new member of the American Association of Independent Professional Baseball and will also be home to the University of Wisconsin-Milwaukee baseball team. In addition, the development will include an indoor sports complex, several restaurants, retail and office buildings, a 149-unit senior living center and 212 market rate apartments. 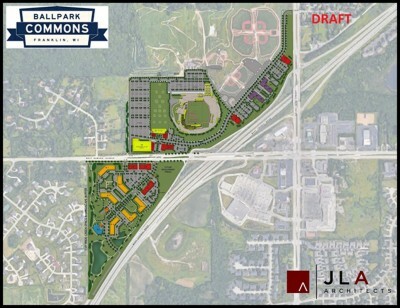 An already existing sports complex and ski hill will remain part of the larger Ballpark Commons development. Shovels broke ground on June 7th, 2018. The first stage of construction was to install the development’s complex storm water management system. County Materials Corporation was called on to manufacture and deliver more than 3 miles of reinforced concrete pipe ranging in size from 12 inches to 72 inches in diameter. 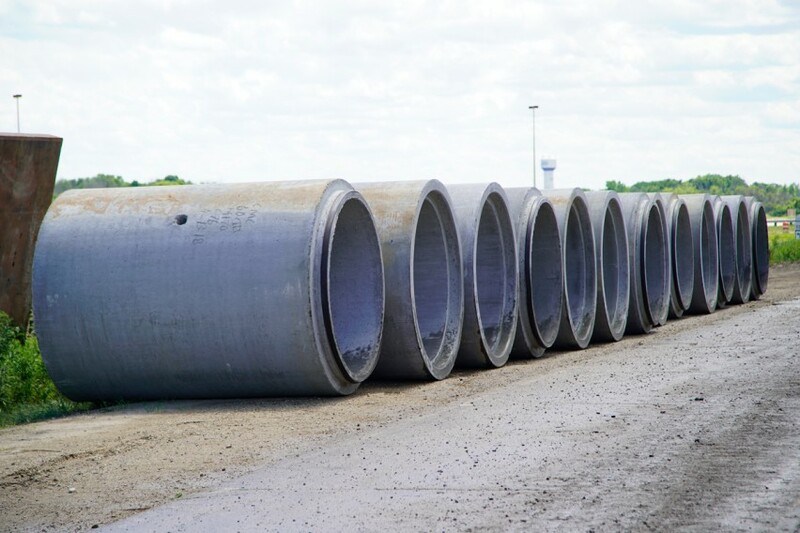 The City of Franklin specifies reinforced concrete pipe for all applications that run under roadways because it’s a rigid, structural water management system that with proper installation can withstand high traffic loads. Equally important, concrete pipe has a proven long service life, making it a clear choice for this community investment. The site’s unique and challenging layout demanded a storm water management system that is capable of handling an unpredictable quantity of runoff. A ski hill to the north presented challenges because its presence increases runoff onto the rest of the development. In addition, the site is split into two sections, each with only one storm water pond. To overcome these challenges, the entire system was designed to handle a 100-year rain-event. Each section conveys storm water from roadways and parking lots along smaller pipes to a main trunk line made up of the largest pipes. The six-foot in diameter trunk lines then direct the water to each section’s respective ponds. 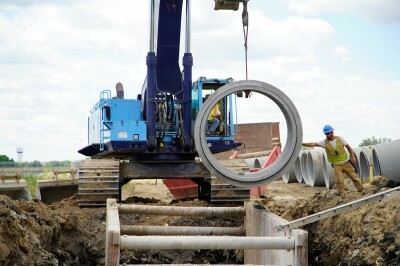 County Materials produced pipe to meet the specifications required for the job and fulfilled the contractor’s delivery demands throughout installation by working with crews onsite to make deliveries when needed. In all, County Materials produced ten sizes of pipe in addition to several sizes of apron end walls. Due to ground conditions, the contractors had to use a bridge lift installation technique for several sections of pipe. To prevent settling, a bedding layer was installed after excavation. The crews then placed a layer of gridding, a second stone layer, another layer of gridding then finally a base layer. The use of concrete pipe, a rigid structure, eased the rest of installation because concrete pipe is not susceptible to rolling and moving, and is a support structure in itself, unlike flexible pipe alternatives. Phase 1 of Ballpark Commons is well underway and is expected to open in spring 2019, just in time for the Milwaukee Milkmen’s Inaugural season. Construction will continue throughout the next two years with the senior living center expected to open in Spring 2020 and the site to be fully developed by 2021. Ballpark Commons is committed to the notion of community and fostering purpose, programming and active participation in the growing Milwaukee metro area. Engineer: JSD Professional Services, Inc.